The National Collegiate Athletic Association Football Rules Committee voted at its annual meeting last month to prohibit the use of kicking tees on extra points and field goals, according to The NCAA News. The rule will apply to all levels of intercollegiate play, and is scheduled to take effect next season. The change was effected to try to reduce scoring in college football. Scoring has significantly increased in college football over the years, from an average of 32 points a game in 1958 to 46 points a game in 1987, The NCAA News reported. "The major factor in that scoring increase has been the increase in field goals and successful point-after-touchdown attempts," said David Nelson, secretary-rules editor of the committee in The NCAA News. "The average number of field goals has increased from .18 a game to a record 2.30 in 1984. Successful PAT attempts have increased from 68 percent in 1958 to 95.6 percent in 1987," he explained. Mike Ahrens '91, a defensive lineman for the Beavers who doubles as the team's placekicker, thought that the rule change "could matter a lot." He used a two-inch block last season to connect on 13 of 17 extra points in MIT's seven games. "I could have a tough time getting under the ball" without the tee, he explained. But regulations which hinder placekickers might help MIT, since the other teams in the New England Collegiate Football Conference have experienced more success kicking the ball than the Beavers. Opposition placekickers outscored Ahrens last season, 27 points to 13. MIT attempted only one field goal (the kick failed), while opponents connected on a perfect five of five, including Mike Choniere's 24-yarder that won a 17-14 game for Assumption College. 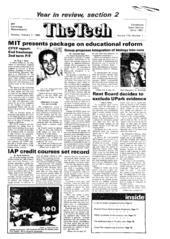 MIT did have slightly more success on extra points than the opposition, which scored only 12 points on PATs. The new rule could have a second beneficial effect on the Beavers' performance if it results in more attempts at two-point conversions. If past performance holds up, the change would increase -- rather than decrease -- the number of points scored by MIT. The Beavers had plenty of success going for the two-point conversion after touchdowns. Shane LaHousse '90 was a perfect 3-for-3 carrying the ball on extra points. Only Bentley College attempted any two-point conversions against MIT, succeeding once out of two tries. The committee also voted to increase the penalty imposed on home teams when crowd noise prevents the offense from putting the ball in play, another rule change which should not hurt Beaver football.